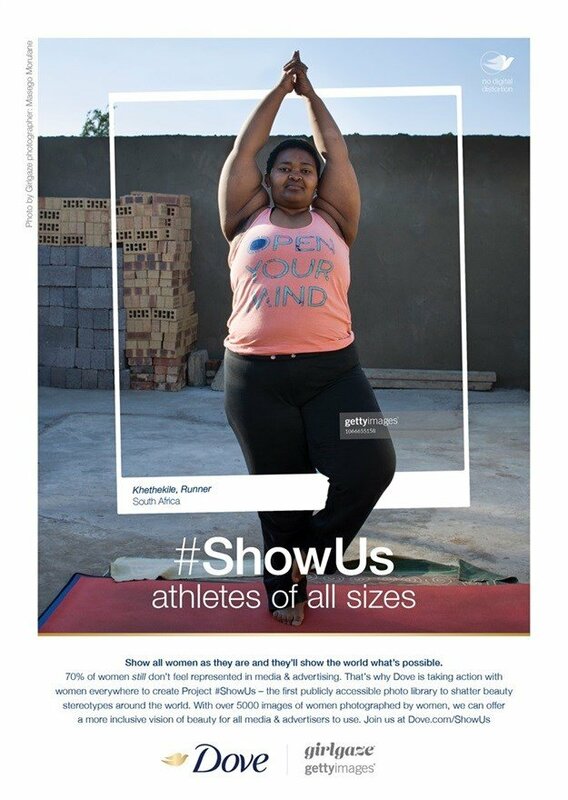 Dove has partnered with Getty Images and Girlgaze to launch Project #ShowUs - the world's largest stock photo library with over 5,000 images, created by women and non-binary individuals to shatter beauty stereotypes and is available now for the media and advertising industries to view, license and use in their next project or campaign. The ambition? To come together and put an end to the narrow definition of beauty consistently portrayed around the world, setting a new standard for the authentic, diverse and inclusive representation of women across the world.71% of South African women say they still don’t feel represented in the images they see every day. Many of us know the mantra “You can’t be what you can’t see,” yet despite this, and decades of work by Dove, Getty Images and Girlgaze to liberate women from limiting stereotypes, many images continue to impose unrealistic beauty standards that present a narrow view of who women are, what they should look like, and what they can achieve. Every day, women’s lives are affected by these limitations, exclusions and stereotypes. It affects their health, relationships and the opportunities they are given. Project #ShowUs is created in partnership with Getty Images – one of the world’s leading creators and distributors of imagery – and Girlgaze – a network of 200,000 female-identifying and non-binary creatives from all around the world. This ground-breaking library of images will be available for use by media and advertisers from today as Dove calls upon creative and media professionals to join them in redefining how women are represented in the images we see around us every single day; celebrating a more diverse and inclusive portrayal of beauty and supporting the confidence of women around the globe by showing them as they want to be seen. 71% of South African women still don't feel represented in media and advertising; the move to a broader definition of beauty has never been more pressing. In one of the largest global studies of its kind, Dove research study shows that globally 67% of women are calling for brands to step up and start taking responsibility for the stock imagery they use, while in South Africa, a staggering 75% of women feel the same way. On Getty Images, the search term “real people” has increased +192% over the past year, “diverse women” by +168%, and “strong women” by +187% providing more evidence of the demand for a more realistic portrayal of women and beauty. There is also a huge need for stock imagery to include women in more progressive and empowering roles and scenarios with “women leaders” up by +202%. Getty Images is a passionate champion for the realistic representation of all through imagery, and through this partnership is proud to be leading the visual industry to change the way women’s beauty is represented in media and advertising. Whilst we’ve seen a positive shift in the popularity of photography that realistically represents women, there’s a lot more to be done. Project #ShowUs will break visual clichés on an unprecedented scale, and we invite all media and advertisers to join the movement. Project #ShowUs marks yet another milestone step by Dove to combat unhelpful beauty stereotypes and empower women everywhere so that their beauty is a source of confidence, and not anxiety. Project #ShowUs is pioneering this change because our reality is that women can’t be what they can’t see, and so with this understanding, Dove looks to challenge unhelpful beauty stereotypes at their source, in a bid to ultimately help women everywhere. Media and advertisers can view, license and use the photos in Project #ShowUs for your next project or campaign at GettyImages.com/ShowUs. Every image licensed will support female photographers of the future and grow the photo library further, so that all media and advertisers can reflect the authentic experiences of women around the world. Women around the world – #ShowUs more women like you. Want to help expand the definition of beauty? Click here to share your images and you could become part of the Project #ShowUs photo library.